ASRock X399M Taichi Review – Due to the colossal size of AMD’s TR4 CPU socket, we never imagined Threadripper motherboards would dip below the ATX form factor, but ASRock has worked its mini magic once again, as we also saw with its epic X299E-ITX/ac mini-ITX X299 motherboard. 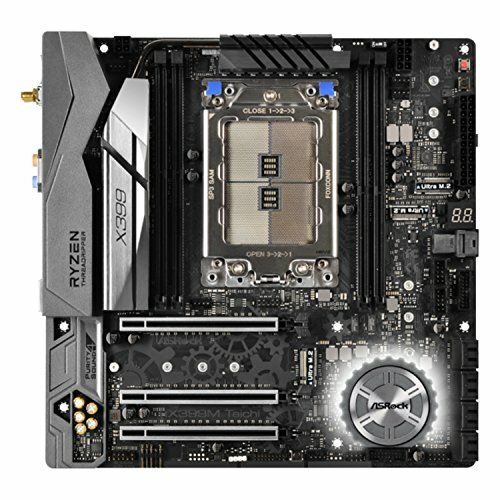 The X399M Taichi doesn’t quite shrink to mini-ITX, but fitting the massive TR4 socket onto a micro-ATX PCB is still quite a feat. 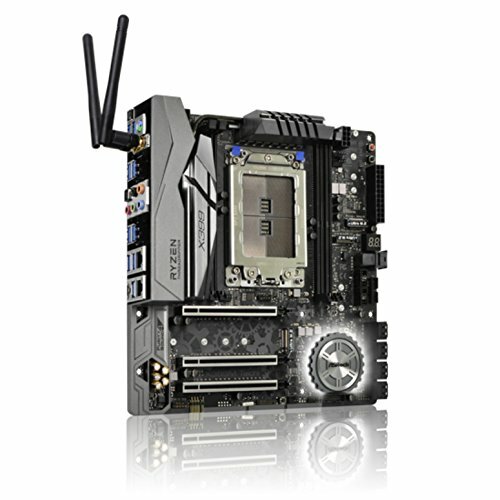 Thankfully, ASRock has done a superb job with the X399M Taichi too. It looks absolutely stunning, with huge, gunmetal grey heatsinks for the CPU power circuitry linked by a heatpipe. These heatsinks are flanked by an I/O panel shroud that hides the unsightly ports underneath. Despite its small size, the X399M Taichi can even comfortably house a pair of dual-slot graphics cards, thanks to the fact that all of the three 16x PCI-E slots on the board can supply the full 16 lanes of bandwidth. Using the first and third slots provides a large gap between graphics cards, while other micro-ATX boards end up sandwiching them together, blocking the top card’s airflow. 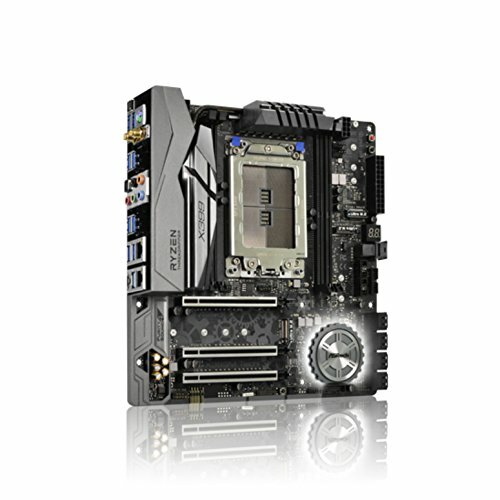 The X399M Taichi uses an 11-phase power design, and it caters well for extreme overclockers with an additional 4-pin CPU power connector. Some space has also been gained by ditching four DIMM slots, reducing the total count to four. However, the board still supports quad-channel memory, you’re just limited to a 64GB maximum, rather than 128GB. There’s a reasonable count of five fan headers on the PCB too, and ASRock’s EFI allows you to switch between the CPU and motherboard as temperature inputs for fan speeds, as well as enabling you to switch off fans below a specific temperature, which is handy for case fans. All but two fan headers are limited to 12 W, with the ‘CPU optional’ and ‘water pump’ headers able to dish out up to 18W. ASRock has squeezed three 4x PCI-E 3 horizontal M.2 SSD mounds onto the PCB too, although none of them has heatsinks and only one supports SATA M.2 SSDs. These slots are in addition to eight SATA 6Gbps ports plus a U.2 port. Meanwhile, USB 3.1 headers were a rarity on the initial batch of X399 boards and ASRock hasn’t seen fit to include one here either. 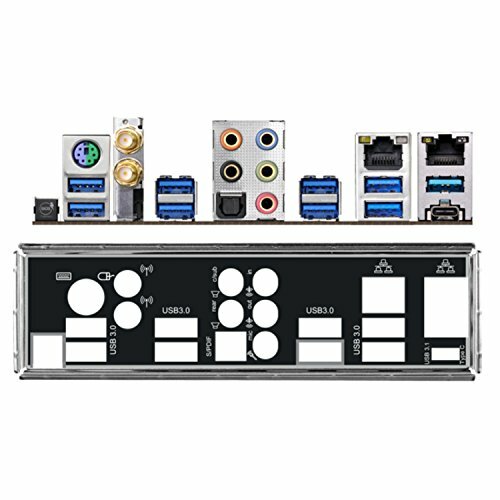 However, you do get USB 3.1 Type-A and Type-C ports on the I/O panel, as well as eight USB 3 ports, so even the most USB port-dependent setups shouldn’t be left wanting. You get a decent Despite its size, it can comfortably house two dual-slot graphics cards array of networking features too, including 802.11ac Wi-Fi that supports speeds up to 433Mb/sec, plus dual Intel Gigabit LAN ports. The PCB offers almost every feature you need from an overclocking and testing point of view as well, with a POST code LED display, clear-CMOS button, power and reset buttons, and USB BIOS flashback button too, which allows you to flash the BIOS without a CPU or memory being installed. The latter might come in handy if you fancy pairing the X399M Taichi with a 2nd Gen Threadripper CPU later this year. ASRock has never been really into laying on masses of RGB lighting, and the X399M Taichi is also colour-neutral, but it makes a rare exception here with several RGB LEDs dotted around the PCH heatsink and a 4-pin RGB LED header on the PCB. Meanwhile, the audio system benefits from a 120dBA SNR DAC, a premium headset amplifier and individual PCB layers for right and left channels, as well as Nichicon gold series audio capacitors. Audio performance was excellent too, with a recorded dynamic range of 114.5dBA and noise level of -109.6dBA. It’s fairly easy to work with ASRock’s EFI, although the usual overclocking settings are spread around more than in Asus or MSI’s EFIs. ASRock’s Windows software also works well, mimicking many of the EFI options, including overclocking and fan control, which provides a more convenient way to fine-tune your system. matches the frequency we achieved with this board’s ATX sibling, the X399 Tachi, and it’s also 50MHz higher than many other X399 boards we’ve tried. The newer board and up-to-date BIOS appeared to have a big impact in some benchmarks too, with the image editing test result being several thousand points ahead of the competition, despite us using identical test hardware. The video encoding test was also a little quicker, while a slower multi-tasking result meant that, overall, the X399M Taichi was on a par with other X399 boards we’ve tested. 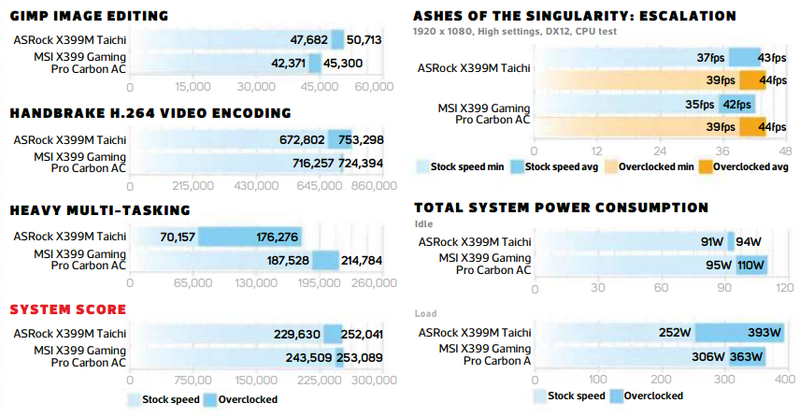 Not surprisingly, the X399M Taichi also had some of the most power-frugal figures on test, drawing just 91W at idle and 252W under load at stock speed. The load power draw was higher than average when overclocked thanks to a higher overclock frequency though. When overclocked, the system score rose from 229,630 to 252,041, while the minimum frame rate in Ashes of the Singularity rose 2fps, matching the best X399 results we’ve seen. 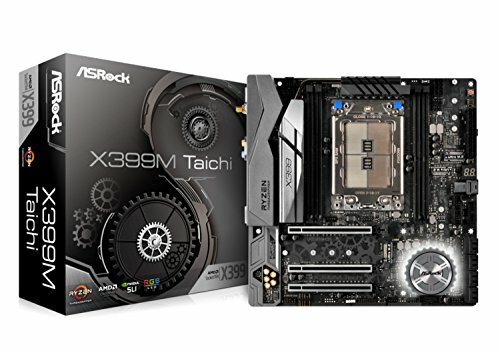 While there are cheaper X399 boards available, the ASRock X399M Taichi isn’t aimed at budget users. It has a huge set of features, and as long as you won’t be using more than two graphics cards, it has all you need to power a monstrous Threadripper system in a compact, micro-ATX form factor. It overclocks particularly well and was happy with 3466MHz memory too. The only downsides are lack of M.2 heatsinks, although you can cheaply buy third-party ones anyway, and the lack of a USB 3.1 header for Type-C port compatible cases. 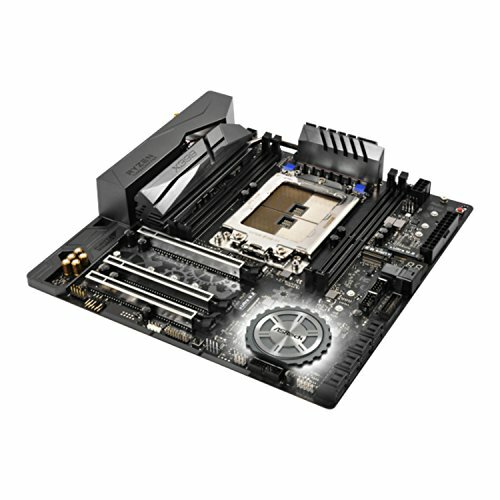 It’s otherwise an awesome motherboard that trumps many ATX X399 motherboards in terms of features too. Powerful, overclockable and perfect for building a monstrous micro-ATX Threadripper PC.